The native Huichol Indians who live near Sayulita in the foothills and highlands of Mexico’s Sierra Madre Mountain range in Riviera Nayarit are direct descendants of the Aztec. What makes the Huichol Indian people so amazing is how they have managed to maintain their unique culture, pre-Columbian traditions, and way of life for centuries: through the fall of the Aztec empire, the Spanish Invasion, and now, the ever-encroaching modern world! Huichol Indians are renowned for their colorful Huichol artwork that expresses their reverence, relationship, and interdependence with nature. Each distinctive piece of Huichol artwork tells a story and the personal style of each artisan can be seen in many of the common themes found including deer, scorpions, arrows, maize (corn), the Peyote cactus, and even the eyes of the Gods. Authentic Huichol Indian artworks are highly collectable since each piece of beadwork or yarn work is hand made using the same traditional artwork techniques handed down for many, many generations. The sale of their artwork is a big part of their economy and essential to the survival of the indigenous Huichol way. Huichol beadwork and yarn art are simply legendary. The indigenous Huichol people are a rare group; small in numbers and one of the last remaining authentic cultures in the Western Hemisphere that still live as their forefathers did – upholding the traditions, beliefs, and ritual practices that date back before the arrival of Christopher Columbus. Huichol Indians exist in a culture that is steeped in spirituality and sacred rituals. They rely upon and strive to be one with nature, and even refer to themselves as the “mirrors of the Gods.” Their gracious lifestyle, humble culture, and magnificent Huichol art offers visitors from around the globe a fascinating educational and cultural experience. Come vacation in Riviera Nayarit and discover the history, the culture, and the unique and captivating artwork of the Huichol Indian People. On your Huichol Mexico adventure you’ll enjoy a full day excursion into Riviera Nayarit’s Sierra Madre Mountains where you’ll experience the natural beauty that surrounds their remote Mexican villages. Heading north from Nuevo Vallarta, the first leg of the Huichol tour includes a stop in Rincon de Guayabitos, an authentic Mexican fishing village. From Guayabitos, the tour heads into the foothills of the Sierra Madre. En route to Nueva Valley, 3,000 feet up the Sierra Madre, tour guests will pass the magnificent and historic city of Compostela, plus the Puga sugar factory, before reaching their destination, a small Huichol Indian village with a population of only 130 indigenous people! The tour includes a visit to an authentic Huichol temple, plus you’ll get to experience Huichol culture first hand, including Huichol artwork, colorful costumes, traditional music, and dance. 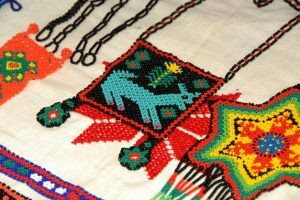 The Huichol will even allow visitors to take “souvenir photographs” and you can purchase authentic beadwork, yarn art, handicrafts, and other artwork right from the source. The Huichol practice many ceremonies that help enrich their culture. This Huichol adventure tour is a world-class cultural experience that you will never forget and will definitely forever cherish! 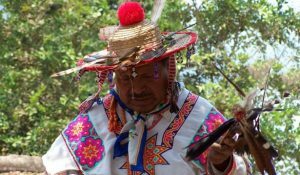 Watch a Youtube video about Huichol Indian village tours in Riviera Nayarit. Visit our Land Activities page to explore other incredible Riviera Nayarit adventures like the San Blas Eco River Tour.